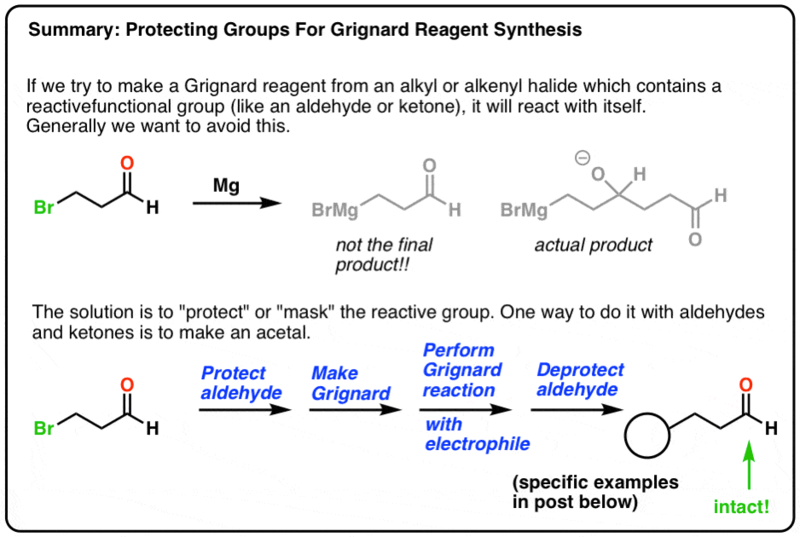 Now that we’ve gone over the most useful reactions of Grignard reagents – addition to epoxides, aldehydes, ketones, and esters – let’s go back to the topic of how to make Grignard reagents, albeit with a twist. In a previous post we said that there are cases where making Grignard reagents can fail due to the presence of an acidic proton. Like this example. The problem here is that Grignard reagents are strong bases, and will react with even weak acids (like alcohols). If we try to make a Grignard on a molecule with an acidic functional group, we’ll end up destroying our Grignard instead. We saw that one way around this problem was to protect alcohols as some kind of inert functional group (like an ether) which doesn’t react with our Grignard. Similarly, there are other cases of molecules where making a Grignard reagent will fail for similar reasons. For example: why does this reaction not give the desired Grignard reagent? The problem here, as you might have guessed if you read the last post, is that this Grignard reagent reacts with itself!!! Once formed, the Grignard would react with the ketone from the starting material. This could then react with Mg to give a new Grignard, which would react with more ketone… and so on. The result is a mess. So how might we get around this? If we were able to find some way to “mask” the ketone in this case, possibly as some unreactive functional group that is completely inert to Grignard reagents, then we could then make the Grignard reagent without causing any problems of self-reactivity. Then, once we’re done, we could then “unmask” the protecting or masking group, revealing our ketone again. Like I said in this post, you use protecting groups a bit like how you use painter’s tape: when you’re painting a room, for instance, you’ll cover up your electrical outlet with painter’s tape, paint the room, and then remove the painter’s tape when you’re done. As you might have suspected, there’s a decent solution for this. It turns out that different varieties of ethers are great protecting groups because they’re unreactive towards strong bases and nucleophiles. Specifically in the case of ketones and aldehydes, a functional group called an acetal (sometimes called “ketal”) is great for the job. Acetals resemble ethers, except that we have a carbon attached to two O-R groups instead of one. Acetals can be made from aldehydes and ketones by treating them with an alcohol and acid. [See relevant post here] . When the acetal protecting group isn’t needed anymore, the ketone or aldehyde can be restored by adding aqueous acid (H3O+). OK, you might ask. So what? How does this work in real life? To answer this question, dear reader, let’s show a specific example. 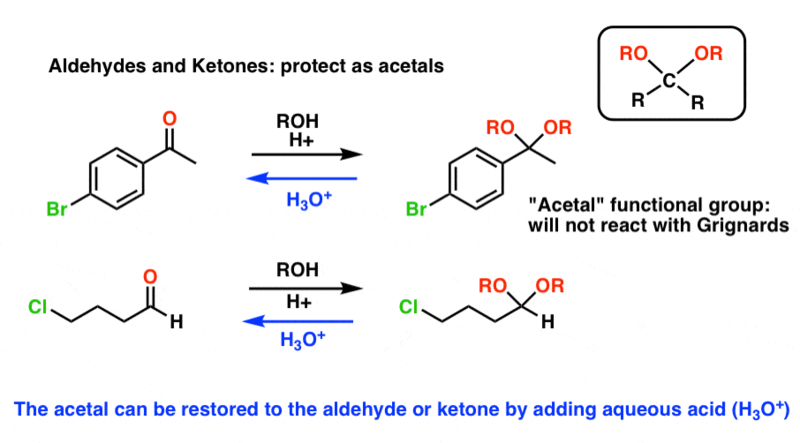 The idea is that if want to make a Grignard reagent on a molecule that contains an aldehyde or ketone, we need to protect that aldehyde or ketone beforehand so that it doesn’t react with itself. Let’s walk through the example above. Note that we have an aryl halide (a halogen attached to a benzene group) that we’d like to turn into a Grignard reagent. However, we also have a ketone. In order to make the Grignard and use it to form a bond with a different ketone, we’d need to protect the ketone on our first molecule. 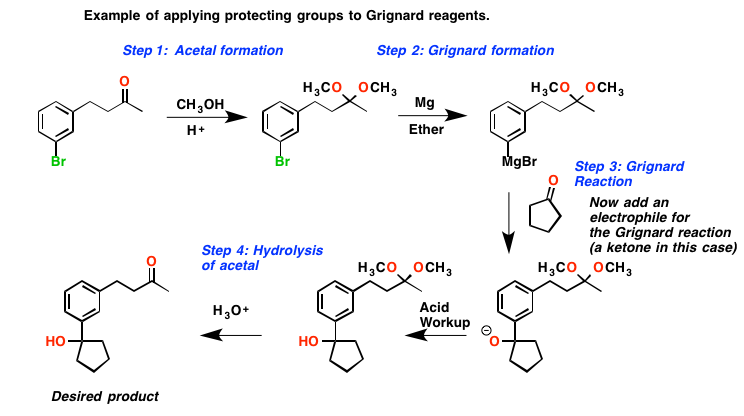 In step 1, we form the acetal, through use of an alcohol (CH3OH in this case) and catalytic acid (such as H2SO4). In step 2, we make our Grignard reagent with magnesium (Mg) metal. “Ether” here is just the solvent – not essential to write out, but often mentioned. The Grignard reagent will not react with the acetal. Finally, in step 4 we add strong aqueous acid, and this cleaves our acetal to restore our ketone. Note that in this case we could combine steps 3 and 4 by quenching with H3O+ and heat, but I wanted to draw out each step separately so that it’s clear. The bottom line for today is to watch out for reactive functional groups when making Grignard reagents. 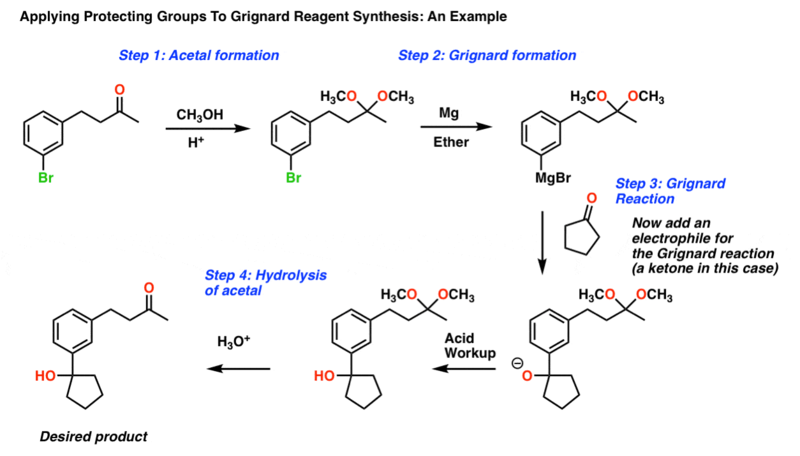 In the next post, let’s start “thinking backwards” when it comes to using Grignards in synthesis. Note: What about the other functional groups we covered, like epoxides and esters? Do we bother protecting them too? 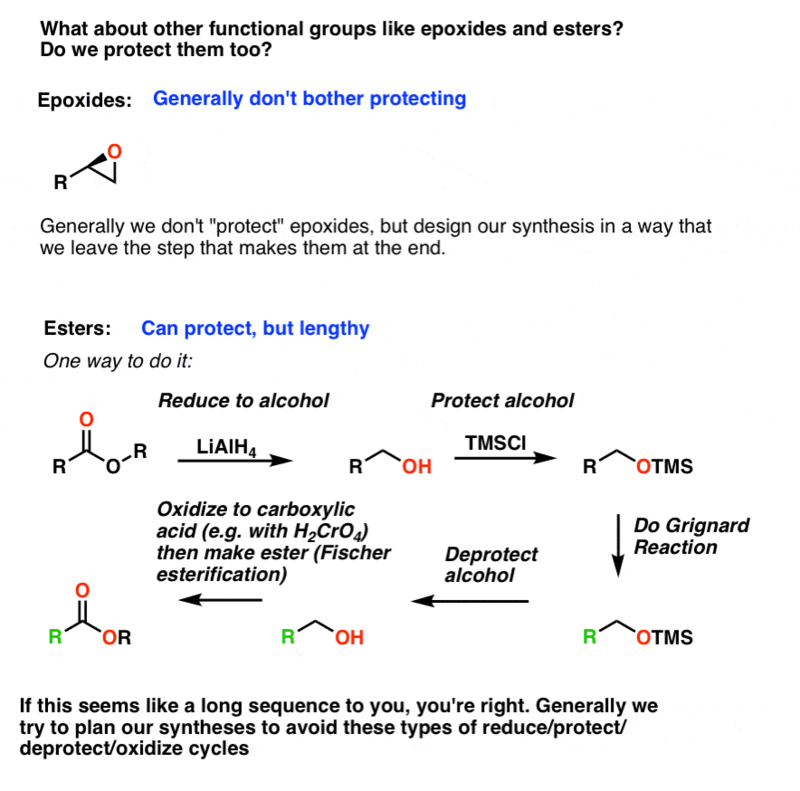 With epoxides, we usually don’t employ a protecting group. Epoxides tend to be pretty reactive species, so it’s generally best to design our synthesis in a way to put the epoxide in at the end. Esters are also a functional group we try to install after making a Grignard reagent, but for slightly different reasons. For our purposes, there aren’t a lot of great protecting groups for esters that are simple to use and will quickly block the group from attack. Instead, we usually have to employ a long sequence which involves 1) reducing the ester to an alcohol 2) protecting the alcohol 3) making the Grignard and then 4) doing the Grignard reaction, then 5) deprotecting the alcohol, 6) oxidizing the alcohol to a carboxylic acid, and then 7) make the ester from the carboxylic acid via Fischer esterification. Phew! In organic synthesis, there’s a phrase we use for a sequence like this. We call it a land war. Like epoxides, the best way to solve the problem of protecting an ester is to avoid it altogether, by designing our synthesis in an intelligent way. how can we reduce just the carboxylic group on a molecule that contains both carboxylic acid and a ketone. Can we protect the ketone with glycol and use LiAlH4 to reduce just the carboxylic acid? Yeah! We can! An acetal is not attacked by a base and is inert in basic medium.So you put some LiAlH4 and when the carboxylic acid is converted to alcohol, you add some mild, weakly-nucleophilic acid(otherwise it can dehydrate the alcohol or have a SN reaction with the alcohol! )–which hydrolyzes the acetal and returns back the ketone.Thus, you get the desired product.